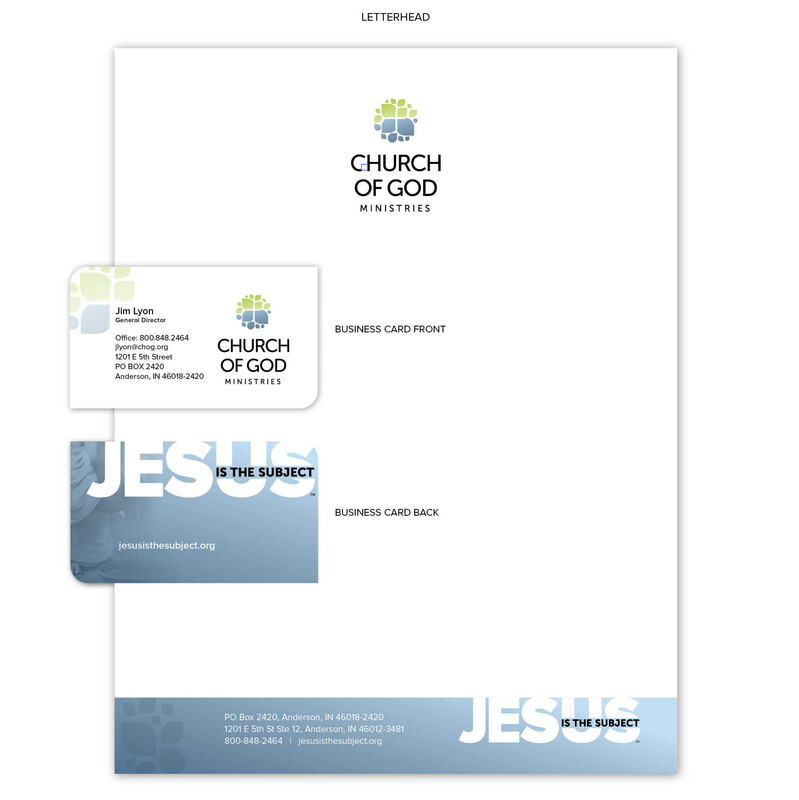 Download below the Church of God logo files and Brand Guidelines for using the Church of God brand logo elements. The brand guide will help you use these Church of God brand assets correctly and consistently. By following these guidelines, you leverage the benefits of the Church of God identity and contribute to its strength. Your understanding and cooperation help protect one of the most valuable assets of our Movement: our brand. If you are ever in doubt, just refer back to these guidelines or send an e-mail. It’s pretty flexible, so be creative while supporting our brand. 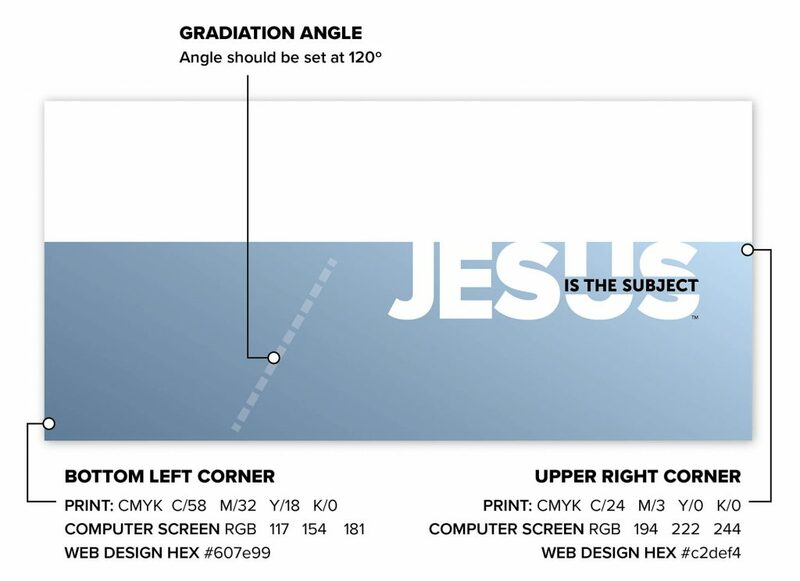 In addition to the logo guidelines above, please reference the examples below when using Jesus is the Subject™ graphics. 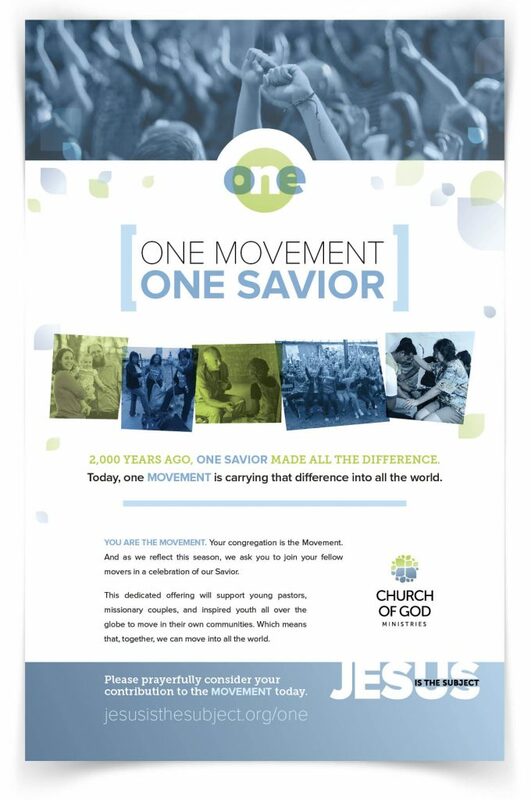 As a body of Christ on the move we encourage you to use the Church of God graphics. 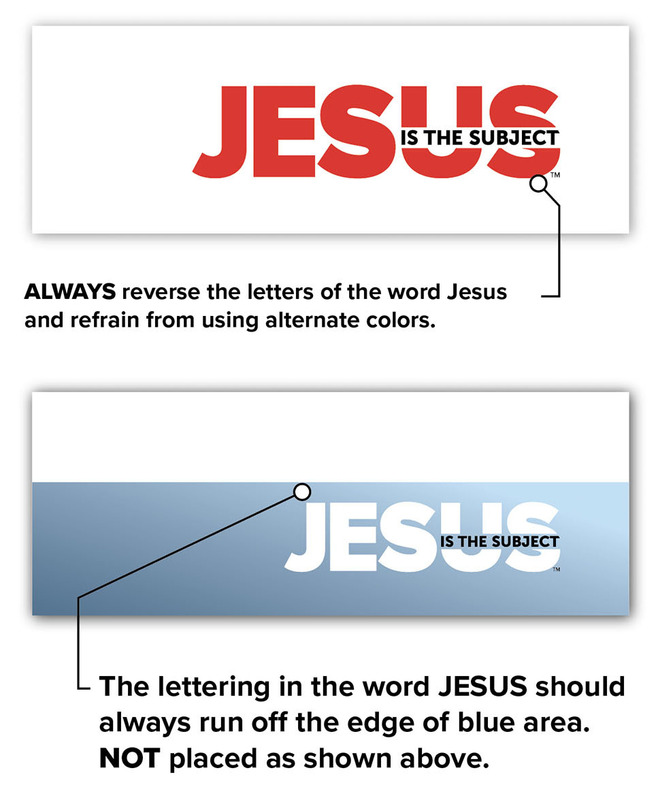 The Jesus is the Subject™ graphics is very adaptable, and these instructions are designed to help you apply it in a variety of media. 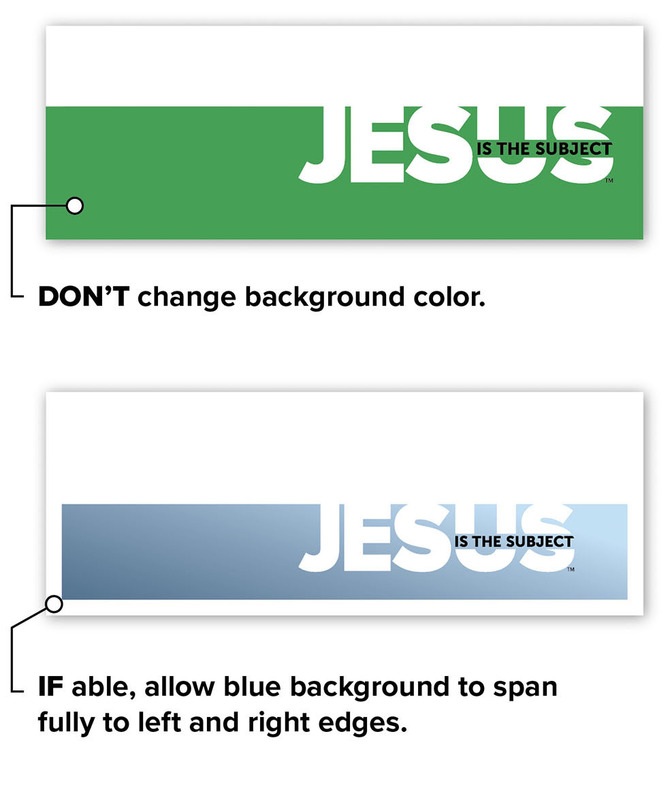 As seen in these visual examples, the word Jesus should always be adjacent to and pouring into the white space above it, even if that space is the edge of the page. The blue band behind it should always span from left to right. The background will contain a blue gradient. Always set to it expand according to width, so that it remains responsive according to the device it’s being viewed on. Values for print and web design are outlined in the graphic diagram. Our brand — and our good name — gain strength and recognition only when they are used consistently. To ensure the strength and consistency, we offer these guidelines. Green is the color of life and growth. It reminds us that the church is a living, growing entity and that we are to be characterized by healthy, vibrant growth. Vibrant life is something that is to characterize us individually as persons, individually as churches, and corporately as a movement worldwide. And health, growth, and healing are things that we offer to others in the person of Jesus Christ and the work of the Holy Spirit. Blue also is a color of life and a color long associated with pure, life-giving water, which is itself often a metaphor for the Holy Spirit in Scripture. The color blue is also associated with peace, with shalom. This color reminds us of Christ as the living water, the breath of life, and the Prince of Peace. The individual pieces within the logo are suggestive of drops of water and leaves, emphasizing the theme of life and growth. The shapes that come to a point at both ends are also highly stylized flames, a subtle reference to the previous logo. The variety of individual pieces also recognizes that we are a body made of many members, congregations, and organizations of different sizes. But the shapes are organized into an organic circle, suggestive of the unity of the movement. The organic nature of the circle, without rigid definition, is suggestive of the organic nature of our unity. “Jesus is the subject.” That is what brings us together. Note that the entire design is focused on the cross, drawing together around the cross, revealing the cross, making Jesus the center. Whatever the pieces of our world might be, whatever the challenges, the relationships, the shapes and sizes of life, they all come together at the Cross—Jesus makes everything whole. The circular form of the logo clearly references wholeness, unity, holiness: something shattered and disparate coming together again, drawn together by the Cross. The elements of the design draw on and reflect themes of Scripture. Consider these examples: Psalm 1:3; Psalm 23:1; Ezekiel 47:6–12; John 4:13–14; John 7:38; 1 Corinthians 12:12–13; and Revelation 22:1–2.